Mod Ian and Mod Bond of the Audio team worked hard to record Mod Liono actually singing the shanties (if you can call it singing)! 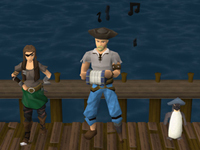 This is a first for RuneScape to include real voice in songs, which have been cunningly composed to remind you of the crazy pirate events that have occurred so far and prepare you to walk the plank once again in the next quest in the series, A Clockwork Syringe, due out later this month. Each shanty has a humourous accompanying cutscene; to see them in-game, head to the bar either on Mos Leâ€™Harmless or in Port Sarim.